When the wifey and I finally decided that we were definitely going to take a long vacation to Australia and New Zealand this December/January, the first thought that popped into my head was, ‘how can I make it to Phillip Island?’. Some may have a different (wrong) opinion, but in my mind Phillip Island is the greatest motorcycle racetrack in the world. Getting to ride there just once would satisfy a lifetime motorsport dream. 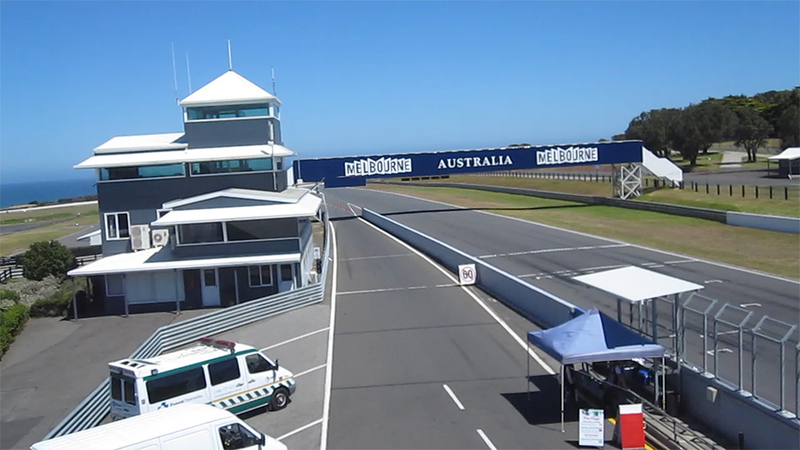 The challenge in doing a track day at Phillip Island is that we had to purchase our flights within Australia (we visited 4 cities) several months in advance, and at the time the track schedule for 2014 wasn’t posted. We ended up planning our stay in Melbourne for 6 days and hoping for the best. I was finally able to book a track day with Phillip Island Ride Days on January 13th, a day after we were scheduled to leave Melbourne. I ended up changing my flight to leave at midnight after the event so that way I wouldn’t have to find another hotel in Melbourne. To prepare I spent some time watching the few onboard lap videos I could find on youtube. After leaving Melbourne at 5 am for a 2 hour drive to the track, I arrived at the front gate of Phillip Island Circuit. Registration was straight forward enough, even though signing waivers at the gate was a bit of mess (everyone had to park, get out, wait in line, sign, then get back in their car, enter the gate). Next I went to sign out my riding gear. I thought I was all set to go when I realized that they didn’t rent back protectors! This oversight was totally my fault, nowhere on the website did they even suggest that back protectors would be provided. I had just assumed they would provide that critical piece of protective gear. At that point I had already committed to the event, so I opted to go ahead as planned. But I’d be lying if I said it didn’t make me nervous, my spine being rather important and all. The rider’s meeting was pretty standard. No speeding in the paddock, here’s what the flags mean, pass with 2 meters of room between you. I was a bit surprised to learn there were no control riders, but Australia is sort of a “do things at your own risk mate” kind of country. There were however an inordinate amount of restrictions set by Phillip Island management. For one, no onboard video cameras. Their reasoning was that they caused more crashes, which to me seemed pretty silly. They also heavily restricted what parts of the facility people could access. You basically couldn’t walk outside of the paddock, which meant no photo ops or video at any of the interesting places at the track. After the rider’s meeting and a brief 1st-time-at-the-track briefing we got assigned our bikes. The PIRD bike rental setup consisted of a fleet Suzuki GSX-R 600’s with track fairings and Dunlop Q2 tires. The rental price was a reasonable $365 a day, and the gear rental was $65. Renters were spread out by session so one bike might have been rented out to a maximum of 4 people. The guy who was assigned my bike in the beginner group told me jokingly, “Don’t crash my bike.” Somewhat in poor taste I thought. 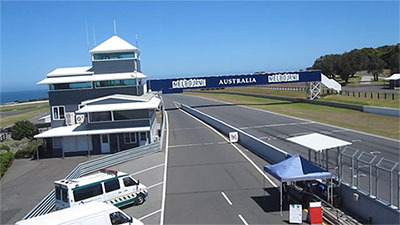 The first time you come out of turn 12 and come hurtling down the front straight the South Ocean rises up to greet you as you pass under the ‘Welcome to Melbourne’ sign, then descend towards turn 1 (Doohan curve), which is taken in 5th gear (on a 600). Seeing the ocean come into view on the horizon while you’re coming up the front straight at full throttle is one of those moments you’ll never forget. That beautiful ocean backdrop was almost a distraction at times, I just wanted to look over my shoulder at the scenery instead of the next turn. Phillip Island has the fastest average speed of any of the 18 tracks on the Moto GP calendar and it felt every bit of it. PI has four corners that are taken in 4th gear (or 5th in the case of turn 1), two of which lead immediately to 2nd gear turns. So on one hand I was definitely not carrying enough speed into the corners on the first few sessions, but on the other hand it was very easy to get greedy and run out of room in the following hard braking zones. Indeed it was the turn 3/turn 4 complex that caused a lot of other riders trouble that day. I didn’t keep track of crashes, but as the day went on there were red flags in almost every session. Sure enough, before the 3rd session my rental bike was the only one not to return to pit lane after a red flag. Fortunately when the other renter on my bike came back on the crash truck he wasn’t hurt, word was that he went down in the slowest corner on the track. As for damage, I later heard that he ended up having to pay the full $3500 worth of damage to the bike. The PIRD staff quickly put me on another bike so I was able to get on my way but that other guy’s day was over before the halfway point. Session by session I gingerly added corner speed and more throttle through the turns. One thing I hadn’t really worked out in my previous season of racing was how hard I could get on the throttle while at full lean on fast turns. 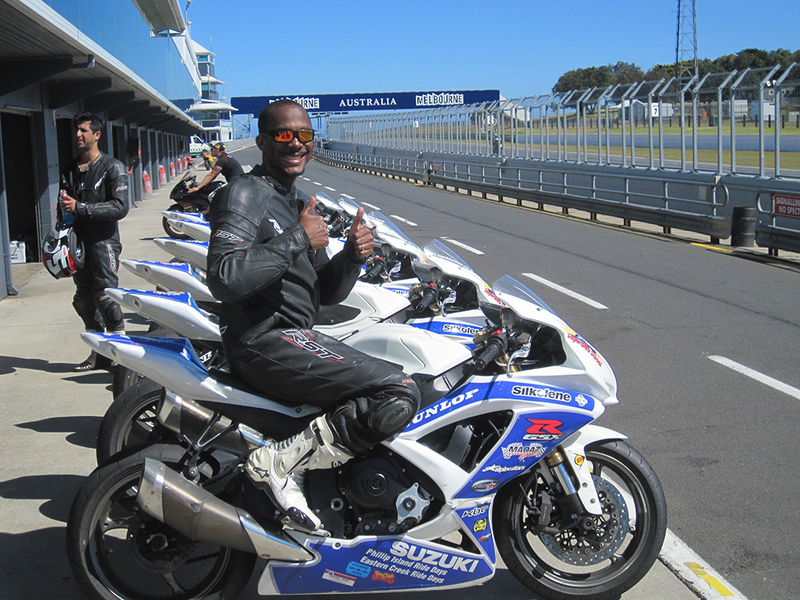 On that point, I asked one of the Phillip Island Ride Day guys for input. ‘Yeh, the key to this track is to be smooth. Ona a six ‘undred you can definitely come through turn 12 or Hayshed at full throttle as long as you’re smooth.’ He said something else about leaving darkies with a knee on the ground on a Moto GP bike, I presume he was talking about Stoner. 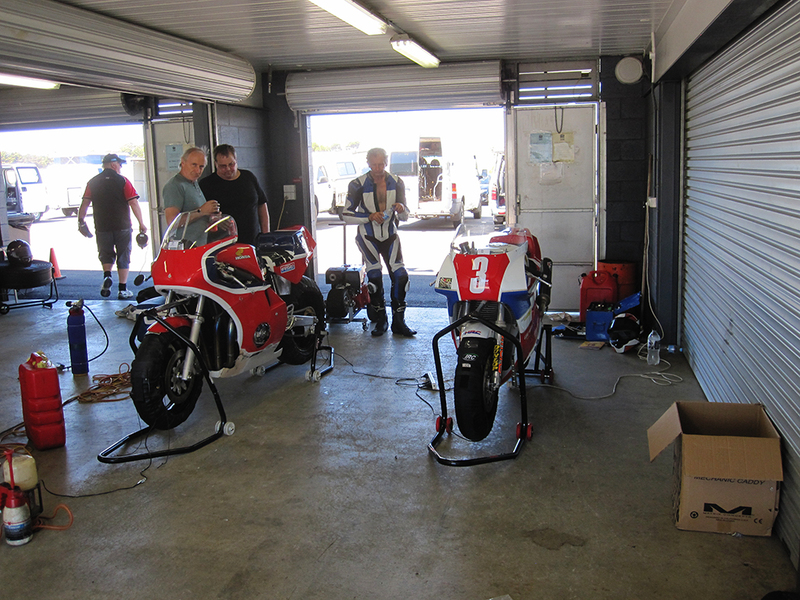 These guys were tracking a RC30 and a custom built RS750 replica. The RS750’s swingarm was cut from solid aluminum billet! As the day went on, I started getting through the fast sections with a knee on the deck and a handful of throttle. Getting any turn right is rewarding, but getting fast turns right makes you feel like a you’re wearing a cape with a S on the back. I was still leaving a lot of margin for error so I can’t say I was getting through those turns perfectly but it was enough to have me grinning under my helmet. I also have to admit that there is a guilty pleasure in passing people when you’re going a buck twenty through a turn. I can only imagine how much fun it would be to race there. By my last session I was going at a pretty good clip for the Medium-Slow group but I have to admit a tinge of disappointment that I didn’t go as fast as I am capable of. However, I managed to not crash the rental bike, which was more than could be said for 3 of the other renters. I genuinely felt bad for the guys who went down on the rental bikes, it turned a $600 track day into a $3000-5000 track day for them. One has to wonder if control riders and some classroom instruction would’ve helped. I know for at least one of them it was his first track day ever. After the day came to a close I checked all of my gear back in and repacked my suitcase for the flight back that night. One thing I hadn’t quite planned properly was how I was going to take a shower before heading to the airport. I had planned on getting soap from the hotel front desk on the way out in the morning but that didn’t work out. I didn’t want to assault the innocent people on my flight with body odor so I had to improvise and take a shower with pink handsoap. Not the best shower but at least the track showers were clean. My track day at Phillip Island was just about everything I had hoped it would be and more. I honestly can’t say I’ve ridden or driven on a more exciting layout. Some of the track’s restrictions were a real drag, but not enough so to ruin it for me. As expensive as it was to make it to this event, it was worth every penny. If I have the opportunity to do Phillip Island again I would do so without hesitation. This experience also opened me up to the possibility of doing other flyaway track events in the future. With luck, maybe I’ll be able to cross tracks like Suzuka, Assen, Spa, or Portimao off my list.